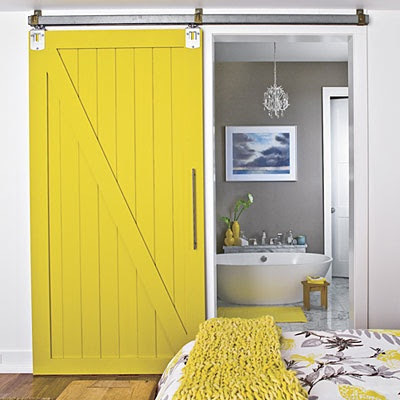 Swoon Style and Home: Shut The Barn Door! When we moved in, that doorway had a door. 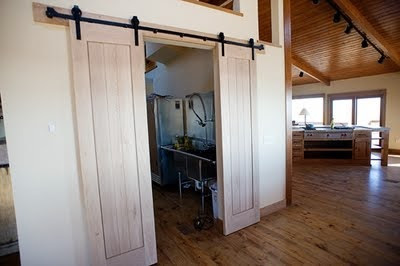 It made sense: it closes off the laundry room and mudroom from the main living space. But I found the door more frustrating than practical: our half bath is behind that door and the large door would always collide with the half bath door. The kids could not open the door. The cat's litterbox is back there, and if we closed the door, he couldn't get back there. So I took the door off, filled in the holes and made it an open doorway. The only problem? My laundry room is totally on display. It doesn't really bother me that much, but the more I lived here, the more I wanted some separation - but something that we could pretty much leave open most of the time and close when we entertain. 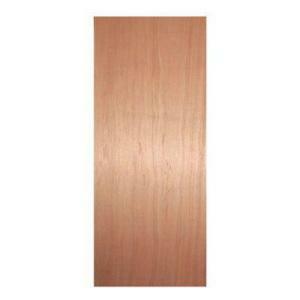 A traditional door on hinges was out. 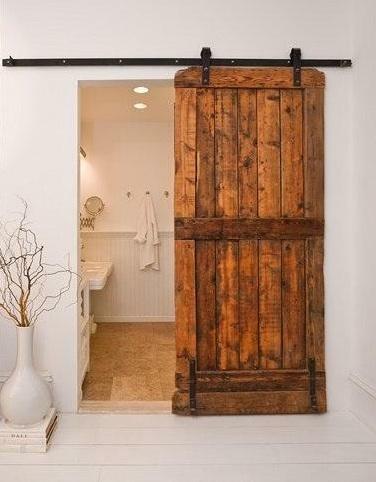 Enter the barn door. 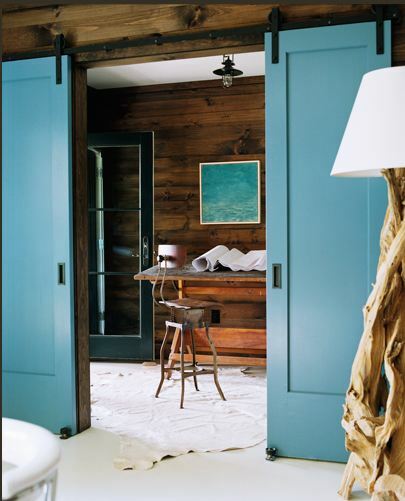 The color of the door is totally undetermined right now - I want to get the wall color up first and see what the room needs ... but I am leaning very heavily toward yellow - maybe glossy, maybe distressed? 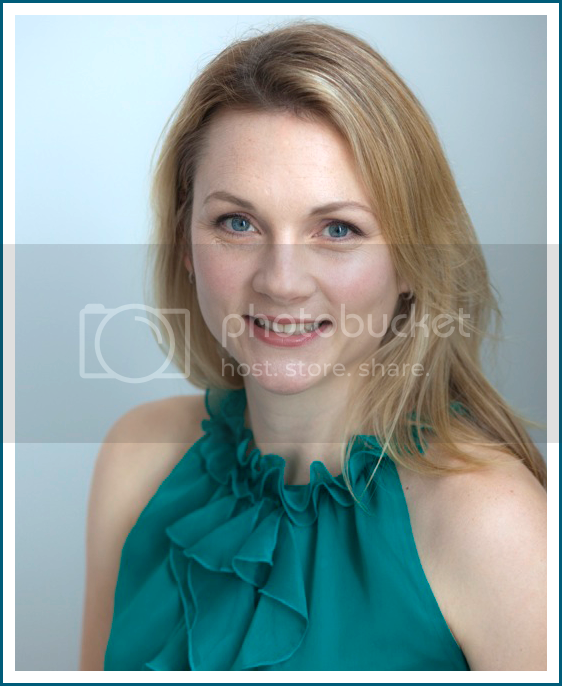 Or maybe even that blue pictured above (though, not sure how it will look with the rest of the space ...). I plan to use some tutorials that I found online (I'll be sure to post the links) and create my own based on their advice and my space. I promise to post the how-to here on the blog. Jamie is going to lend a hand and hopefully we can hang this bad boy in a day. Stay tuned! Have you or do you want to hang a barn door in your house? I'm all ears! Oh! It's going to look so good there! I wish i had a space that it would work, but no such luck. It's the perfect spot! I'm so excited to see this project develop! Thanks everyone! The hardware is proving to be more than challenging, as it's pretty heavy and a bit larger than my space, but I am determined to make this work. You know I'll share here - the good bad ugly and hopefully successful! 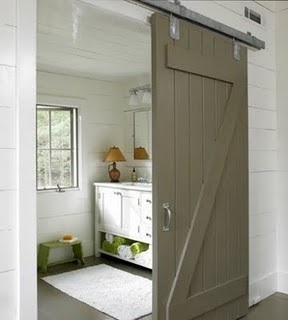 I love the barn doors! Oh, and look at that bright yellow one you posted first...Still loving that yellow I see :).